Finding bookshelf speakers with great performance under the $200 mark could be challenging for most people. Many of the speakers within this price range lack the awesome sound delivery and performance of their pricier colleagues although that is not to say there are no good speakers within the range. For the sake of your sound system upgrades, we compared the performance and attributes of a lot of speakers so as to bring you the best budget stereo speakers. Right here before you are 5 of the best bookshelf speakers under 200 dollars, take a seat and follow us as we take you through some of the best budget speakers for pc as well as other uses. Our review of the best stereo speakers under $200 starts with none other than the compact and simple Polk Audio TSi100. A first look at the speaker will endear you to its sleek and elegant design of either black or a bright woody cherry. The speaker makes its way into our list of the best budget bookshelf speakers under $200 not just because of its build quality and aesthetics but also because of its excellent performance and sound quality which seems uncommon for most speakers in its price range. JBL is one name you can always trust to deliver the best as far as audio and sound are concerned. The JBL Arena comes in beautiful black or white matte finish with a one-inch dome tweeter that delivers clean and powerful highs in a classic and minimalistic speaker. The JBL Arena 120 makes the entry for its great performance as well as a responsive bass which we must be commended. The Klipsch R-15M strikes you as attractive and appealing but that’s not all. This aesthetically pleasing speaker has got some quite awesome performance to cement its spot as one of the best bookshelf speakers under 200 dollars. The Package comes with two passive speakers which are individually capable of 80watts continuous power output and a peak of 340watts. The speaker is equipped with a Tractrix horn that made its treble very clean and clear. Overall, the Klipsch R-15M delivers a great sound performance that is hard to come by among other speakers within its price range. You’ll know by now that not being able to afford the best bookshelf speakers under $2000 or thereabouts does not imply a lack of good and quality sound output. Along with an admirable performance, the Edifier R1700BT rocks a stylish and unique look despite Edifier’s history of not being really into core aesthetics. Along with being affordable as one of the best bookshelf speakers under $200, the R1700BT is also one of the best Bluetooth bookshelf speakers. The Mackie CR4 is one speaker with promises of studio-quality sound output as well as rocking a stylish and pretty modern design. With the Mackie CR4, you get studio-quality sound output from a versatile speaker. The speaker comes with great specifications and a sophisticated appearance. Made from a wooden cabinet, the CR4 has a 3.5mm headphone jack on the front making it easy to locate volume and other controls. There is an inbuilt isolation pad that helps to greatly improve sound quality and for at such a low price, the Mackie CR4 completes our list of the best cheap bookshelf speakers under $200, a tough list that was not easy to compile. Excellent aesthetics and design: the Mackie CR4 retails at an affordable price but does not look cheap in any way. The looks are strictly modern and sophisticated. Ease of use: The speaker can be easily controlled with easily navigable buttons such as the headphone jack which is situated right in front of the speaker. Accessories include the main cable, stereo RCA cables for connection to PC, mobile devices as well as connecting the right and left speakers together. We dug around to find pros but could only find about one or two customers reporting that their speakers refused to function after some time. Most cheap speakers lack the necessary quality performance to be considered a noteworthy addition to your home’s sounds system. 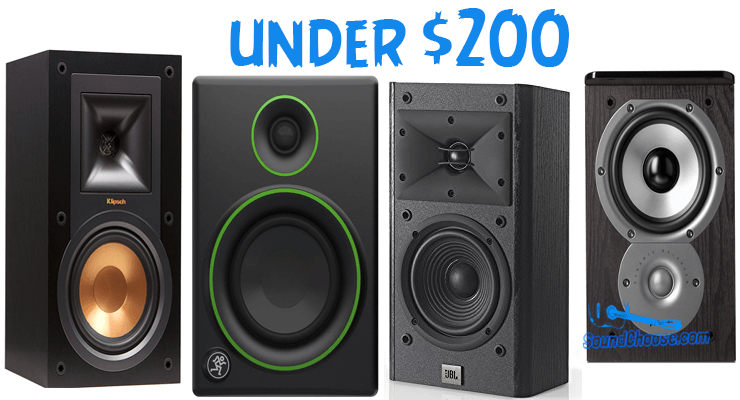 However, all of these best bookshelf speakers under $200 have been reviewed thoroughly and at such reasonable prices, they are guaranteed to light up your home and greatly improve your audio experience. It is not every day you come across great speakers at an equally great price. For a token of some sort, these best bookshelf speakers are also the best small hi-fi speakers for the money as far as value is concerned. Make your selection among these today and you can start to enjoy your home’s sound quality on a whole new level.